Rockstar successfully launched GTA: San Andreas on iOS devices last month, followed by yet another unfortunate launch on Android a week before Christmas where no one was able to actually download the game on launch day. Naturally, Rockstar made good with an update to the Android version the next day, and the iOS version also received an update yesterday fixing a few bugs, and now they have finally officially announced the game's availability with a new trailer. Rockstar says GTA: San Andreas for mobile devices is the best looking yet, and features re-mastered, high-resolution graphics including lighting enhancements, an enriched color palette and improved character models. San Andreas on Android also supports compatible USB and Bluetooth Android controllers including the popular MOGA brand series. The iOS version also supports various controllers. If you haven't already got it you can get it for �4.99 ($�6.99) for your iOS, Android, or Kindle HDX device from the�App Store,�Google Play, and the Amazon Appstore�respectively. The Windows Phone version is apparently still coming soon. To celebrate the mobile release, Rockstar will be giving away 10 limited edition prize packs filled with various San Andreas gear. We're also celebrating the GTA San Andreas mobile release with a special limited-edition gear giveaway going on starting today til January 13th, 2014 with your chance to score some rare San Andreas gear over at the�Rockstar Games Facebook�page. 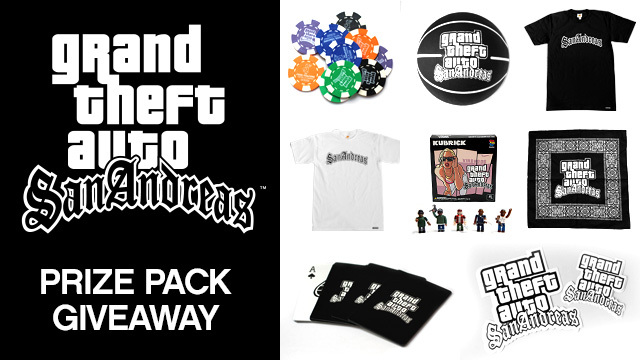 Enter now�through end-of-day next Monday January 13th for the chance to win one of ten�Deluxe San Andreas Prize Packs�including coveted collectibles like the San Andreas Kubrick Box Set, Basketball, Playing Cards and Poker Chip Set, Black San Andreas Tee, White San Andreas Tee, Bandana and stickers. Stay tuned as well throughout this winter season as we'll be bringing these items from the San Andreas Collection to the�Rockstar Warehouse�for purchase.